Here’s the first layout I’ve made in 2016! I needed a bit of inspiration to get be back to scrapping, so I turned to the Jot Magazine January 2016 Mood Board. The colours were beautiful and I managed to pull lots of bits and pieces from my stash that would suit it! This is another one for My 30th Birthday party album, the photo is from the morning of the party when we were all waking up from a night of camping, and trying to ignore the drizzly weather! 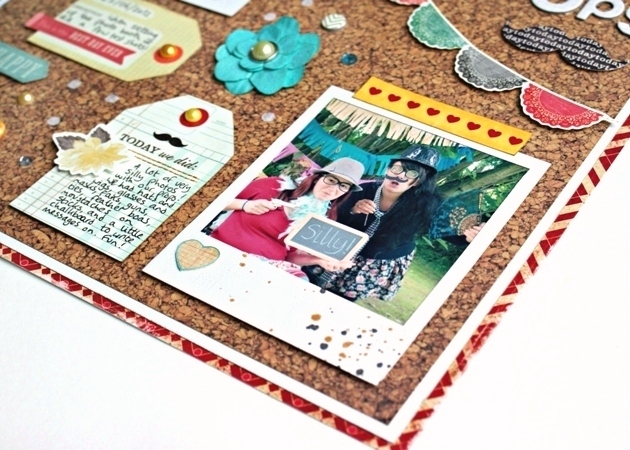 Then I just had to finish off with my journaling and some enamel dots and gems! We may have woken up to a drizzly grey day for our party, but that wouldn’t stop us from smiling! Do you think I did the mood board justice? I could probably have done with a bit more newsprint or florals, but I didn’t have any newsprint in my stash and I figured the doilies were okay instead of florals! 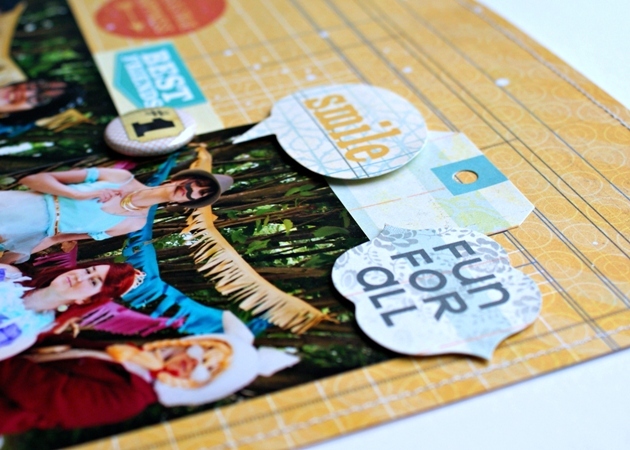 The mood board challenge is open for another week-or-so if you want to enter! Hello, how is everyone? 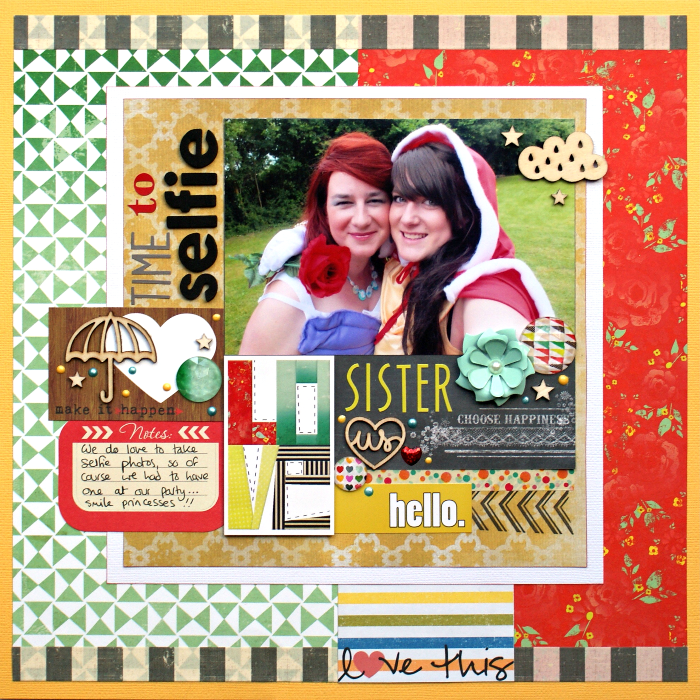 Apparently I’m still not in the mood for Christmas scrapbooking – today I’ve got a layout with a photo from the joint birthday party I shared with my sister in June 2012. I was drawn to the bright colours in the picture! In case anyone doesn’t know, a ‘selfie’ is a photo taken by yourself, at arms length (not using a timer/tripod). My sister is amazing at taking these so we always take one (or several) when we’re together! As my photo was landscape I rotated the sketch to have the bulk of embellishments and details below the photo. 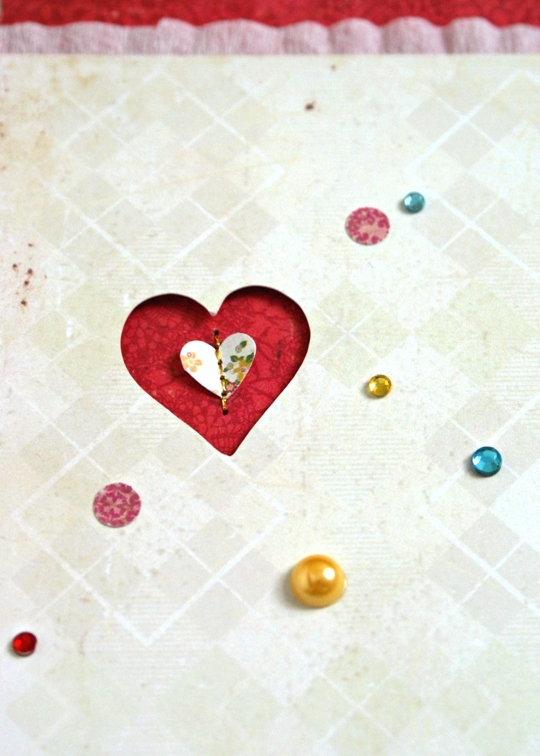 I also added a cluster of hearts above the ‘Hello’ sticker, using a Wild & Free Giant Rhinestone with a pattern of hearts, a Freckled Fawn Wood Veneer, and a Papermania red heart gem, to echo the heart in the sketch! Ah, this page is so happy and summery! I’m not in total denial about the time of year though, I have been pouring through recipe books and planning some food to bake, and Santa knocked on our door last night, so I know Christmas is truly on the way! Are you crafting for the festive season right now? The Sketch Challenge is open until the 13th of December, and they have a huge prize for one entrant, so check it out. They also announced a Design Team call for the sketch team today, which is HERE if you might be interested! 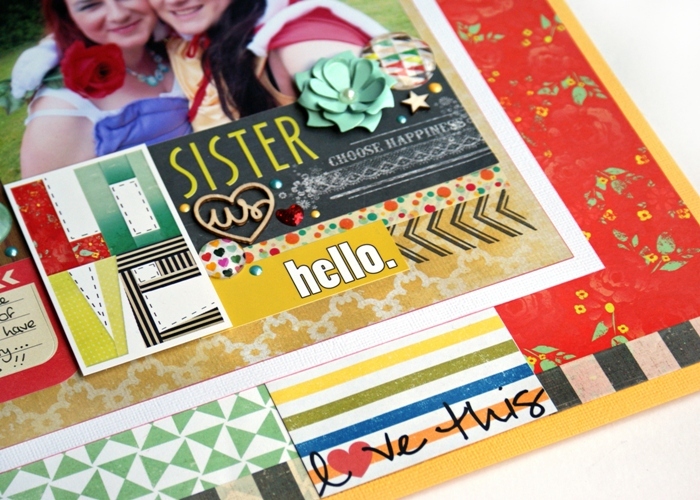 I created this layout for a Crate Paper challenge called ‘Love Red’. My page was featured as a runner-up on their round-up post HERE! 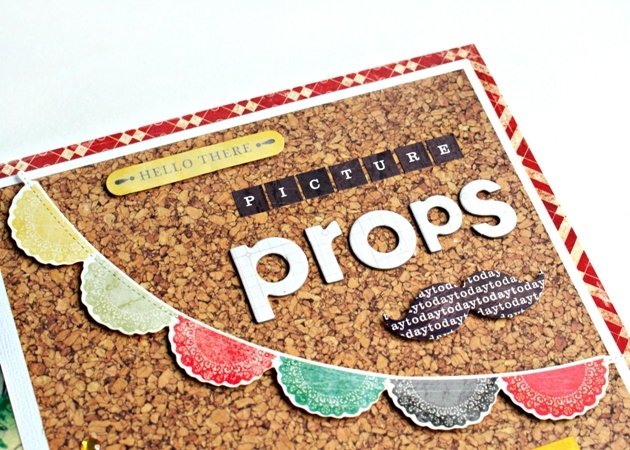 The colour red has been sneaking back into scrapbook collections more and more, and I love how it really stands out on my projects! 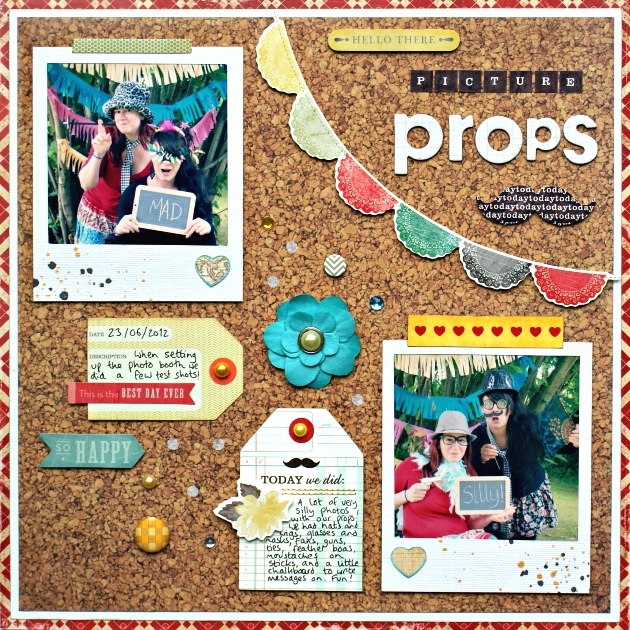 I used the cork-board Storyteller ‘Archives’ paper as the background, so that the photos and items look like an eclectic mix of bits and pieces, all pinned together. I framed the cork-board paper by layering it onto white cardstock, and then onto some red & cream patterned paper (Fourteen ‘Connection) – this defines the edge of my page, but because the red is patterned it doesn’t dominate the rest of the layout. You can also just about see some white crepe paper dots. I’m using crepe paper on all my layouts about my 30th Birthday, to bring them all together. I just punched these ones with an ordinary hole punch – they add a subtle detail to the background. I love this page because the whole feel of it reminds me of the crazy fun me and my sister were having, grabbing random bits and putting them together for a silly costume photo! And the bold touches of red are perfect. Have you used the colour red on any projects lately? Supplies: Pink Paislee Portfolio ‘Outstanding Paper and Ephemera, Elle’s Studio The Sweet Life Note Tags, Cut Outs, and ‘True Happiness’ Stamp; flair from ‘Here & Now’ Kit. Mr Huey ‘Calico White’ mist. Red Ink Pad, Black Journaling Pen, White Crepe Paper, Sewing Machine with White Thread. We didn’t get many shots with ‘serious’ poses, as we kept laughing so much! 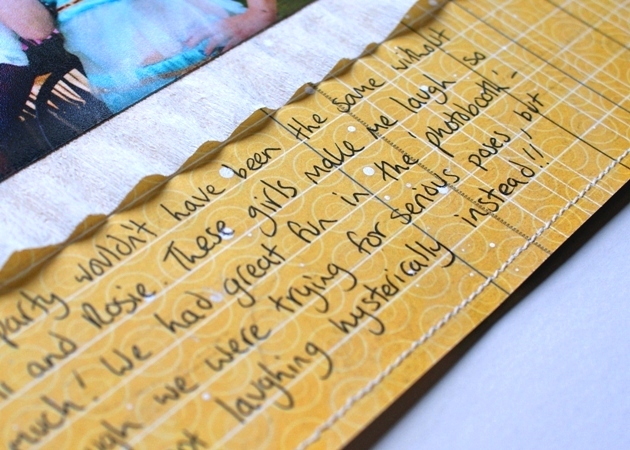 The ‘giggle giggle’ title was cut using my Slice, and I stuck it down just along the middle, so it looks like it’s landed on the page – I got the idea to do this from a layout by Lilith Eeckels here. 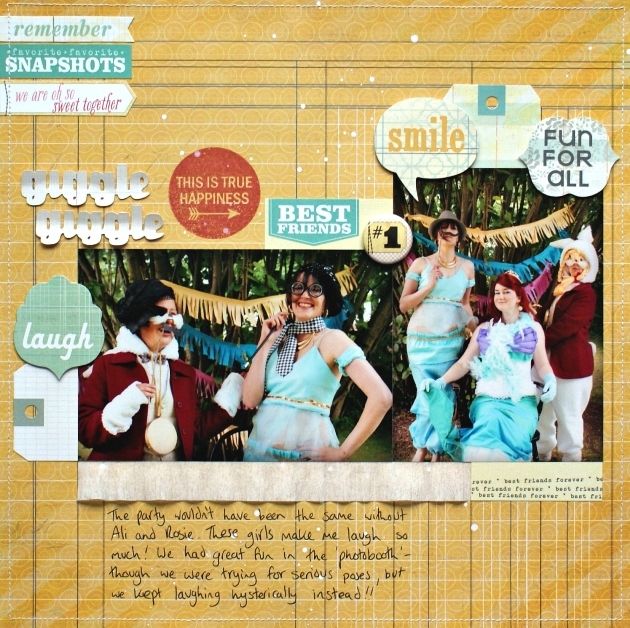 I love this layout – it captures the fun we had! Do you have any people that always make you laugh? Have you got a photo of them laughing? If not, I suggest setting up a silly photobooth, and dressing up until you can’t stop giggling! 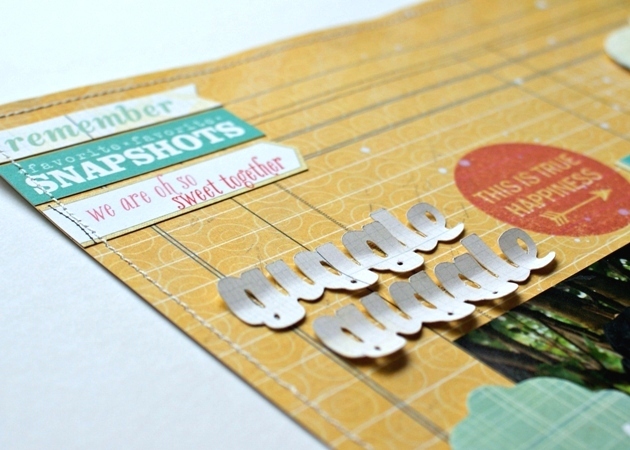 Supplies: American Crafts Cardstock ‘Seafoam’, Bazzill Basics Cardstock ‘White’. Studio Calico Hey Day 6×6 Pad. Crate Paper ‘Eleanor’ Little Bo Peep Paper and a Little Bo Peep Border Sticker. Martha Stewart Doily Lace Punch. Echo Park ‘Everyday Eclectic’ Stickers and Alphas. Maya Road Numbers. White Crepe Paper, Sequins. This layout documents my feelings about life as I turned 30 – how I felt quite happy to reach this age as I’d already achieved my most important goals. I made the page bright and happy to echo the positive feelings, and scattered some sequins and stickers about like the table confetti that was at the party! I also added some crepe paper as there’s crepe paper on every scrapbook page about my 30th birthday. What birthday projects could you be getting on with? Link them up to the challenge before the 14 November at 1pm, and you’ll be in with a chance to win a £5 gift voucher to the SJ Crafts online shop! 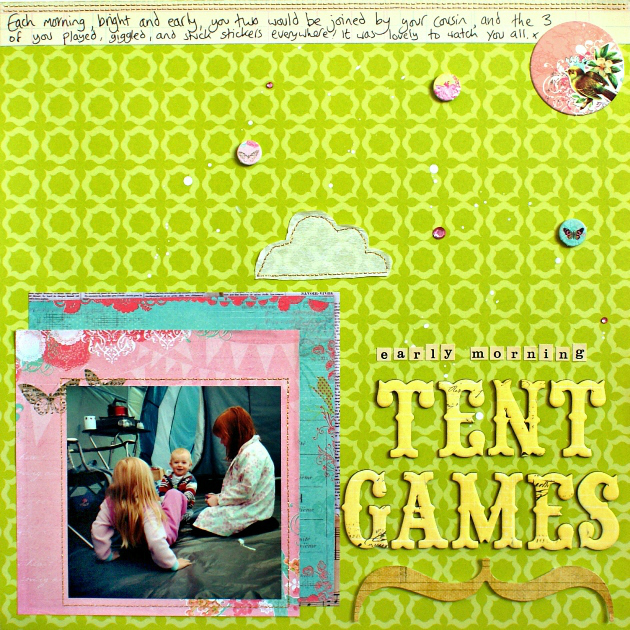 Tent Games – A Layout for a Pink Paislee Challenge! Yay, I can tick another item off my list of ‘10 things I’d like to join in with‘, as I just finished making this layout for Pink Paislee’s Social Media Challenge Week! This page was inspired by the Instagram blog post by Jennifer Evans. Do you use Instagram? I like it when I use it, but that doesn’t happen very often. The main problem is that while I don’t have a smart phone, I do have an Ipod Touch – which basically means I can download all the apps and games, but I can’t ring anyone from it, and I don’t get roaming internet. So I can use my wifi at home to upload photos, and tweet, etc, but when I really want to use it – when I’m out and about – I don’t have internet connection. Pink Paislee Supplies: Soiree ‘Music’ Paper, a strip of Vintage Vogue ‘Corner Boutique’ Paper, Spring Jubilee 6×6 Papers and Chipboard Shapes, Mistables Chipboard Alphabet, and Old School Element Stickers. 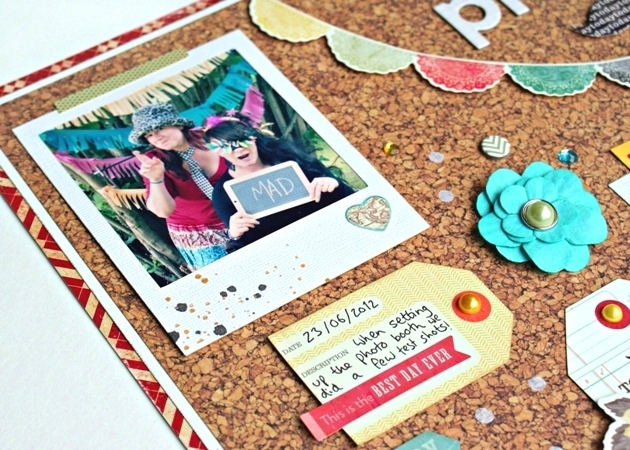 I love the bright colours of the Soiree and Spring Jubilee papers, they bring out the lighter hues in the photo nicely, and remind me that it was a summer party day! I kept the main items near the bottom of the page, and added hints of gold thread, because it wasn’t long after sunrise when the kids were all playing in the tent. The photo isn’t perfect, but it’s the only one I have of them playing so early in the day, which is one thing I’m thankful to my Ipod for – I have it nearby when a normal camera isn’t in reach, and I’m able to capture moments like this – just look at baby boy’s happy face! I’m glad I’ve managed to capture the happy feeling with the bright elements of the page. 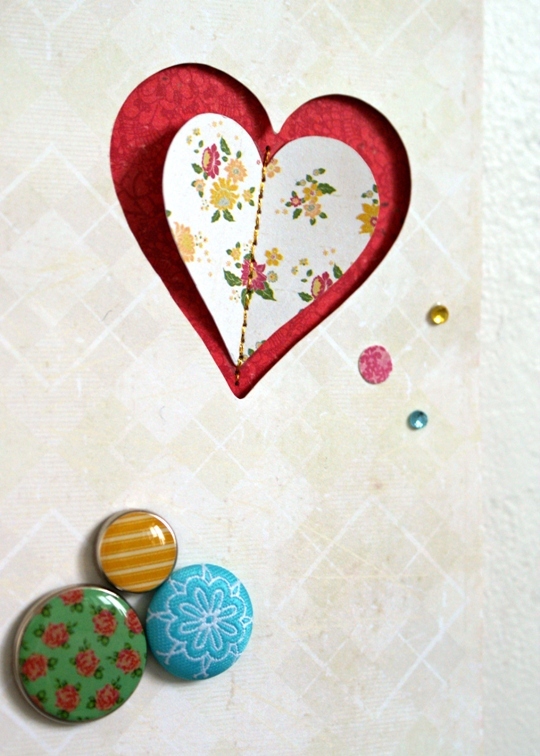 I was inspired to layer up the punched circles by this layout of Lisa-Jane’s, though mine aren’t scalloped! And of course the page includes my usual scattering of small bits and pieces! It’s nice to have made a page featuring just me and my hubby, there aren’t enough photos of just the two of us.